[New for 2017] Ok, time to push this review out of the queue and up to the ol' interwebs. It's not a flattering review but I'm fairly confident it doesn't deserve a flattering review. For the record, I hate this pint design. A lot. 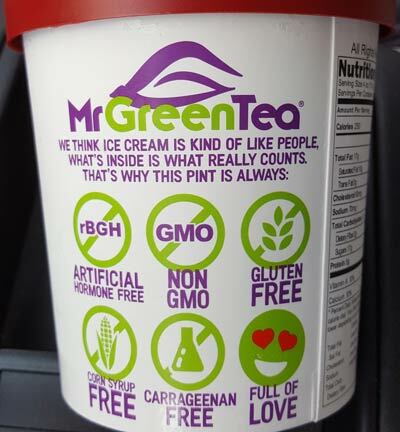 Whoever designed it thinks they are pretty clever with huge colored coded text, but who doesn't put the logo on the front of the pint? That does not fly, especially in today's social media focused world. 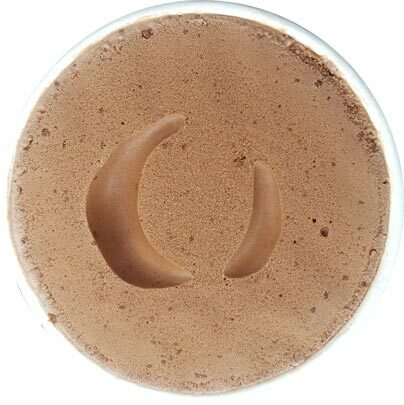 Let's be honest here, the front of the pint looks like something from the DHARMA initiative. There is a point during every bite where you just want to spit it out. The nutrition label mentions sunflower oil in the chips and I think that's part of what's just really odd here. If you've ever had sunbutter, there is this odd roughness to the taste and that's coming through here. Let me stop and clarify here. 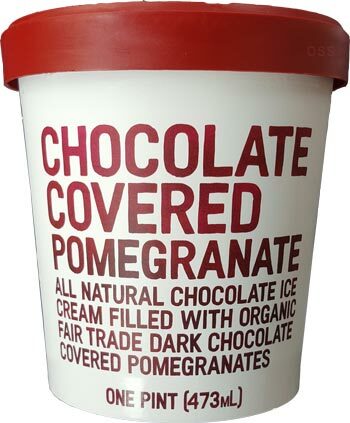 The giant bold letters on the pint distinctly say "dark chocolate covered pomegranates" but you probably noticed I keep saying "pomegranate chips". 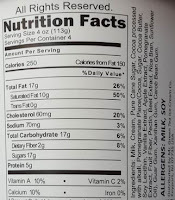 If you read the ingredients list (see below), you will see listed "pomegranate piece" which includes pomegranate extract. That kind of seems like bait and switch to me. Ok, I'll let it sit for another five minutes to see if that helps. Eating the melted edges helps a little.... emphasis on little, like very little. The texture is just so awful on this, it feels like Arctic Zero or something. Why, just why would you do this? It just feels so odd on your tongue. Not cool. I think I might actually return this tomorrow. On Second Scoop: Well, I did it, I actually returned a pint of ice cream. The more I thought about this pint, the more I got frustrated and the more I realized I deserved my money back for whatever this mess is. I actually went back to try and second scoop it but I just couldn't do it. Reviewing their ginger flavor went well, so I can't help but think that I just accidentally (aka hopefully) bought the most awfully freezerburned pint ever. Several months ago I bought a big container of Alden's ice cream which too had a horrendous texture, but at least that had a more tolerable flavor. Even with a good texture, I still wouldn't want to eat this flavor. The flavor was terrible and don't get me started on the "pieces" again. Since I have no urge to try their other 2017 flavor which is coffee based, it looks like MGT won't be back on the blog again until at least 2018. 250 calories for THAT? Wow... thanks for the review, I usually really enjoy this brand of ice cream but haven't had a chance to try the new flavors yet! I wonder if the Cold Brew Coffee will be any more good... but at this point, I don't think I'm going to try it. I was actually VERY impressed with Enlightened's Cold Brew Pint, which I thought tasted like Chick-fil-A's Frosted Coffee (and my father/brother both said it reminded them of Arby's Jamocha shake), so I'll hold off. I, too, HATE the new pint designs. I'm also a little bitter about the fact that Mr Green Tea company, a company selling so many exotic flavors and having "Tea" in the name, never released a Taro Bubble Tea flavor in this new line! With their current line up, you'd expect this to be out there like pomegranate ice cream with chocolate chips but it's not. If you like pomegranate and can get a fresh sample, maybe you'd dig it, but I know this one is not for me though. Not even a little. There were no positives for me here. Where is the pomegranate seeds?! @Dubba This seems like an ill-conceived flavor to begin with. I would think it would be better to go with pomegranate ice cream with dark chocolate chips or chocolate with a pomegranate jam swirl. I often have no idea what you're talking about when you say flavors are "dry", but this one looks like a freakin' desert, man. @Aaron: I was thinking pomegranate base but a sweet pomegranate swirl would make this one very unique. instead we got this mess. I totally forgot to mention those in this review and yeah, that's how you deliver a pomegranate flavor! 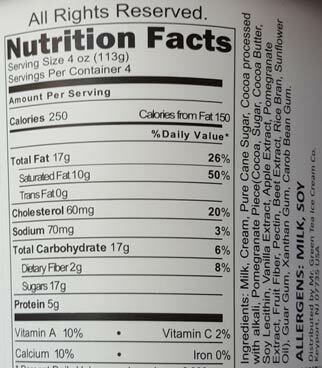 That mismatch between description and ingredients list seems to almost verge on misbranding. I'd have expected chocolate ice cream with chocolate covered pomegranate seeds (the actual arils, like Trader Joe's sells, not the gel stuff). Which could be good or could be texturally too weird. The HD bars are tasty, agreed. Many years ago there was Sheer Bliss pomegranate ice cream, straight or with dark chocolate, in the neat metal pints.